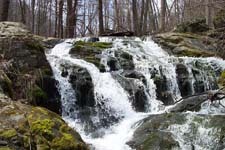 Description: This is an 8.7 mile moderate circuit hike having a little of everything the Shenandoah has to offer: ridge lines, a view, rock outcrops and lots of waterfalls and rapids. The first 4 miles is a brisk walk down Piney Ridge followed by an equivalent amount of walking along Piney Branch. At first, Piney Branch Trail zig-zags through a flat rocky area only occasionally following the stream. After climbing up a series of switchbacks the scenery suddenly changes. The valley narrows and for nearly 2 miles you pass waterfall after waterfall, some at eye level, others 50+ feet below you. Most require some degree of bushwhacking in order to explore them close-up. Except for one short section of trail the climb out of valley is relatively gradual. There are 4 stream crossings in all. The lower two may pose some degree of difficulty during periods of high water. The hike starts at the Piney Branch Trail kiosk near a maintenance building. The driveway is not marked but obvious. Trail Notes: From the parking area find the bulletin board and trail post for Piney Branch Trail between the parking area and Skyline Drive. Proceed down the blue-blazed Piney Branch Trail. In about 0.3 miles, come to the junction of the white-blazed Appalachian Trail. It is a woods road at this point. Turn right here. Follow the AT to the PATC Range Cabin and a partial view east. Leave the AT, walking through the clearing, toward the spring, and turning right onto a service road. At the top of the hill (less than 50 yd.) turn left onto blue-blazed Piney Ridge Trail. For the next 3.7 miles the walk is all downhill. At 2.0 miles from the last trail junction pass the Dwyer graveyard on the right marked by a cairn and then the junction with the blue-blazed Fork Trail. Piney Ridge Trail goes to the left. To shorten the hike by 1.1 miles and miss the lower 2 stream crossings turn left here and pick up the directions later. Otherwise continue straight onto Fork Trail. Continuing on Fork Trail for 1.09 miles, come to the junction of yellow-blazed Hull School Trail. Turn left, following it down to Piney Run where you'll make your first crossing. Turn left, walking upstream. For a short distance Hull School and Piney Branch Trails share the same tread. In about 300 yd. Hull School trail will bear off to the right. Continue straight on blue-blazed Piney Branch Trail. Re-cross Piney Branch and in 0.67 miles from the last trail intersection pass blue-blazed Piney Ridge Trail on the left. In about a half of a mile the valley will narrow and you'll have to negotiate a series of switchbacks taking you high above the stream. Soon after this the views begin as stream climbs swiftly to meet you. None of the falls or rapids are right on the trail but a few are easy enough to bushwhack to. Others are harder to reach.In about a mile re-cross Piney Branch and begin a steep climb out of the valley. The stream will be below you and to your left. There are more waterfalls here but they are harder to see and to get to. Soon the steep climb will lessen and at 2.39 miles from the last trail junction you'll come to a T intersection. Poole Bridge Trail comes in from the right. You'll turn left staying on Piney Branch Trail. Dip down and cross Piney Branch for the last time. A couple of nice long switchbacks will help you almost to the top of the ridge. The last 0.5 miles will be a straight climb, crossing what appears to be a trail, but is actually the route of some survey posts, and the AT before reaching the parking lot and your vehicle. Critique: I made a two day hike out of this. Started on Skyline Drive; hiked down Piney Ridge Trail, taking a left on the trail at the intersection with Fork Trail, and continued on Pine Ridge to the Hull School Trail, where I crossed the stream and camped for the night. The next morning I continued west on Hull School Trail, right on the Fork Trail, and hiked back to Skyline Drive on Piney Ridge. The 1.11 stretch of Piney Ridge to Piney Branch is very steep, with a lot of switchbacks. Suggest going downhill on this stretch, not uphill. Saw a black bear in this area. There is a good camping spot at the intersection of Hull School Trail and Piney Branch, just on the west side of the stream, far enough away from trail to be hidden. Only ran into two groups the entire hike. Overall, it is one of the lesser used routes in the northern section of SNP. Critique: This was a very enjoyable hike. If Little Devil Stairs is the bully of this neighborhood in SNP, Piney Branch is the beautiful girl next door. There are waterfalls and swimming holes all along this route, and plentiful campsites by the river as well. We did the hike backwards, going down Piney Branch and up Piney Ridge. You can see pictures we took here. Critique: Clearly marked trail, good variety of streams, elevation change, can't wait to get back to the area in the spring for wildflowers. It started snowing about halfway through the hike, and fog covered the higher elevations, which made driving back fun. Saw only one other pair hiking. 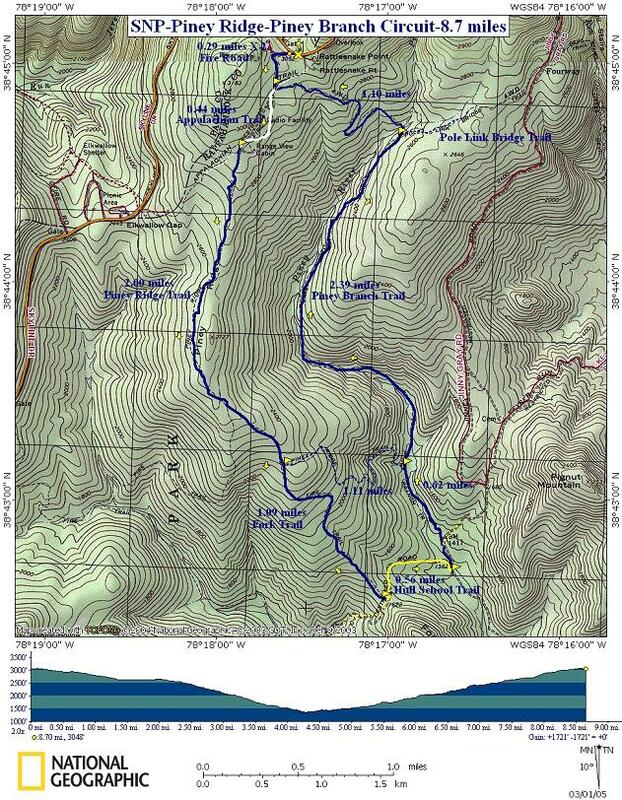 Critique: A mentally relaxing, physically stimulating hike. It was a cold (35) and windy (10-15mph+) morning when I left the parking lot and made my way down the ridge. Though given some cover by the trees, this hike is along a common wind current that hits the park; having a wind layer in your bag is almost always a good idea in this part of the ridge line. There were a number of cars at the parking area from overnighters - but I only saw 4 groups of people the entire day. There is much evidence of past habitation along this route; Stone fences, a cemetery with reminders of how short life could be on the mountain, old foundations, road beds, old piles of harvested lumber, and even a few metal artifacts - interesting fodder for day dreams and speculation. 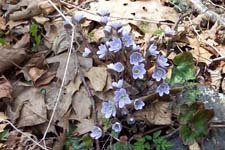 This time of year there are lots of blooming wild flowers (Wild Geraniums, Star & Plain Chickweed) and song birds. The new leaves just drooping from the trees lays a bright green fog over the woods that contrasts severely with the dark tree trunks. The geology of the hike is primary weathered greenstone, but if you keep a keen eye out, you can discover some limestone chunks with fossil prints in them. The hike up Piney Branch was torturing me: I was on a tight timetable and couldn't explore/photograph the numerous cascades and waterfalls. Piney Branch has a "personality" much like the Hughes River, just smaller. All in all a beautiful hike that stands on its own without sweeping vistas. Critique: Added some distance ~2 miles by parking at Hogback, picking up AT to Piney Ridge then down to Hull School and up Piney Branch toward the top of Little Devils, but then turned onto Sugarloaf to AT and Hogback. Would give it a 4, but water was high from last week's 1.5" of rain and every rock I stepped on was ice covered. Crossing Piney Branch was difficult at best and I did slip & get wet. Water is very cold. Crossing without walking sticks would be nearly impossible. Few deer on the trail and saw two hardy campers where Piney Ridge/Hull School trails met. 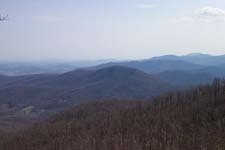 Critique: We did this hike starting from the parking lot at Little Devil's Stairs, and followed Piney Ridge up and Piney Branch back down. This was a very nice hike with changing terrain. The stream crossings weren't bad, though would be challenging with higher water. We also saw two bears. The hike doesn't have sweeping vistas but offers quiet solitude with a very nice workout. Critique: I must say this was a rather interesting hike. In the main synopsis, you describe this trail as "...having a little of everything that the Shenandoah has to offer..." and you weren't kidding! We saw everything you had mentioned, with the added surprise of a rather large black bear who came within 10-15 feet from us about 3 miles into the trail. I think it's extremely important to stress to people that when hiking in the Shenandoah there is a very real possibility of this occurring, and one should be prepared to handle the situation should it arise. Other than that little adventure, the rest of the hike was quite beautiful. 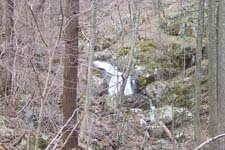 We, without realizing it at first, added to the length of the trail somewhat by staying on Hull School at the Piney Run junction following it downstream until we reached the end of the National Park territory, then backtracked to Piney Run. This added about 2.5 miles to the hike which made the incline on the later half a bit more intense. It was an excellent workout!! comment: Did a slightly different version of this hike starting from the Little Devil's Stairs parking area at the bottom of the mountain. Personally I like to get the uphill portion over at the beginning of the hike when my energy level is at it's highest. The Piney Branch section of the trail has a couple of challenging stream crossing if the water level is higher in the spring months. And if you choose to start at the bottom as we did there is a great old hemlock stand on the Fire Road. Overall a nice hike with varying scenery.